Starting Jupyter Notebooks (but even after 5 min does not start) – IDEAS? What Should We Do Next? Some users may experience an issue where Jupyter notebooks may not start even after appearing to load for 5-10 minutes. 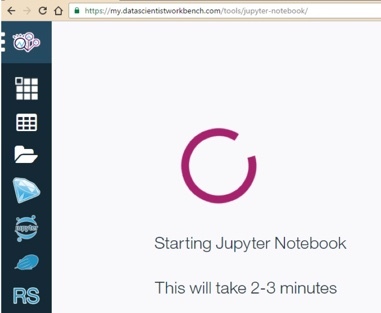 Initially when you launch Jupyter you get a spinning wheel saying Starting Jupyter Notebooks ... which under normal loads is expected to take 2-3minutes. Sometimes, during high load times, you may need to be a little more patient, as it may can 3-5minutes. 1. If you see the left menu bar, click on the bottom button to logout and re-login. If Jupyter notebooks still don't launch after logging in again, try step 2. 2. Try opening Jupyter notebooks in a different browser e.g. Chrome or Firefox (note that only recent versions of Chrome and Firefox are supported, Internet Explorer is not supported). 3. Sometimes it may be an issue with cookies. This is a known issue and to workaround you can delete all cookies for *.datascientistworkbench.com in your browser. 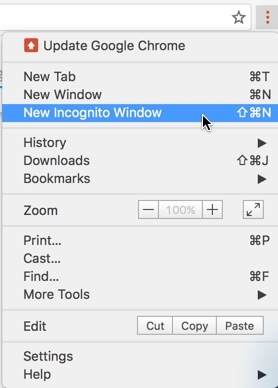 Or, an easier workaround is to open Jupyter notebooks in a New Private Window in Firefox, or New Incognito Window in Chrome (note that you will need to login again). 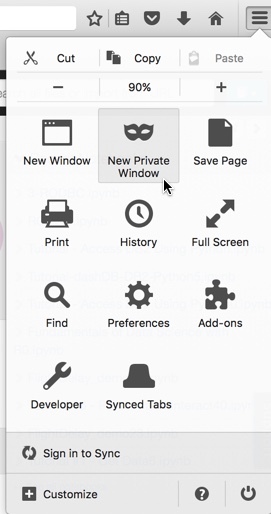 Links to open new Private/Incognito windows can be found in the browser menu bar, which can be expanded by clicking the 3 bars or dots in the upper right hand corner of the browser. Note: one side effect of doing Step 3 above is that your noteooks and data may not show up in the right bar in Jupyter under Recent Notebooks and Recent Data. Don't worry, they are still available in Data Scientist Workbench under My Data. Just click the My Data (folder icon) in the left menu bar. Once it opens just click Back, to go up one level to /resources and you can find your Jupyter notebooks there. Click on a notebook (.ipynb) file and it will open up in Jupyter. If neither of the steps resolve your issue, you should open a ticket, by clicking on the Support tab in the right-center of any Data Scientist Workbench page.